The accumulation of prostaglandin E2 (PGE2) during chronic inflammation has been implicated in the progression of several cancers. Cyclooxygenase is the key enzyme of PGE2, although the degradation enzyme 15-hydroxyprostaglandin dehydrogenase (15-PGDH) has received considerable attention recently. We investigated the molecular mechanisms of pancreatic ductal adenocarcinoma (PDAC) progression via 15-PGDH downregulation. Here, we found that 15-PGDH expression was inversely correlated with ALDH1, an important cancer stem cell-associated marker indicative of poor prognosis in humans. Moreover, we demonstrated that pharmacological inhibition of 15-PGDH enhanced CYP26A1 expression, leading to depletion of all-trans retinoic acid (ATRA) and expansion of the ALDH1-positive subset in both human PDAC cells and tumor cells of KrasLSL-G12D/+; Ptf1aCre/+ (KC) mice. Furthermore, genetic deletion of 15-Pgdh in KC mice showed PGE2 accumulation and ATRA depletion in the pancreas, resulting in PDAC with high levels of Aldh1 and Ki-67. Finally, ATRA replacement suppressed 15-PGDH inhibition-induced tumor progression in KC mice, and ATRA treatment attenuated Aldh1 activity in tumor cells isolated from the pancreas of 15-Pgdh-/- KC mice. 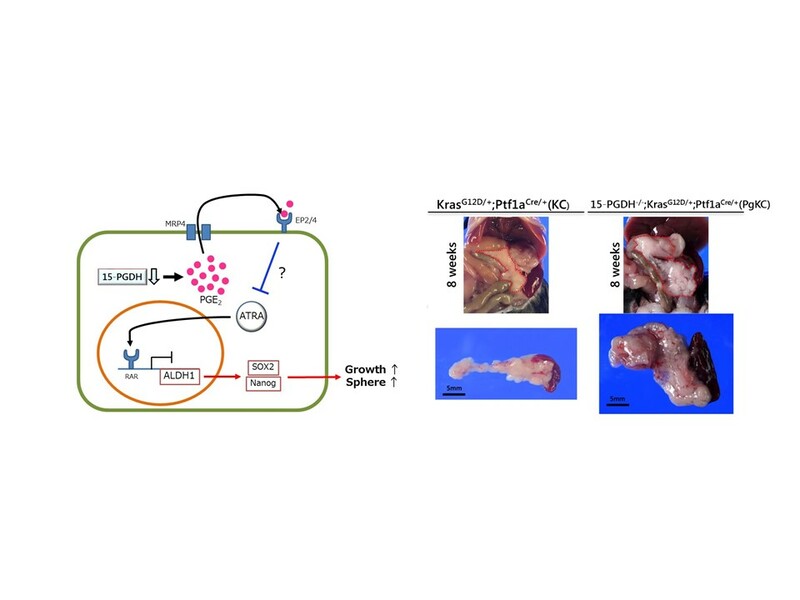 These findings provide evidence that 15-PGDH inhibition enhances KRAS-driven tumor progression via ATRA depletion in the pancreas. Therefore, ATRA replacement could be a potential strategy for PDAC treatment.